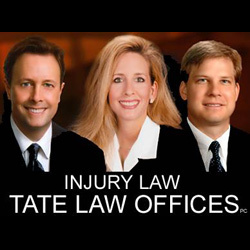 Tate Law Offices is a Texas-based law firm that provides legal representation in auto accident, motorcycle accident, pedestrian accident, construction accident and other types of personal injuries. The firm represents clients when we believe we can add significant value to their case. We don't advertise on TV to do a mass volume of cases because we believe the cases we take need detailed attention in order to collect the maximum amount of compensation for our client. Over the years we have handled thousands of cases ranging from injured backs to deaths and everywhere in between. We deal with insurance companies, defense lawyers, and medical experts on a daily basis and we have a long list of doctors, therapists, and imaging facilities to send our clients to. We analyze cases for free and give our recommendation of the best direction for a case. D Magazine has chosen us as one of the "Best Lawyers in Dallas." Bottom line, we are a results oriented law firm and achieving a great result for you, our client, is our mission on every case.